Nothing gets attention like a guard dog (or a guard dog warning sign). 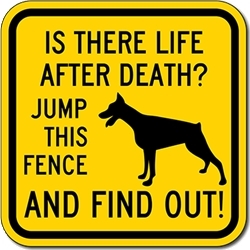 These high-visibility signs make no mistake about a canine presence guarding your property. Customize your sign by choosing the guard dog of your choice! DOUBLE the working life of your No Trespassing Guard Dog Signs by adding 3M Protective Overlay Film (POF)! 3M’s high-tech POF protects sign faces against fading caused by the sun and harsh weather—and makes graffiti and sticker defacement damage easy to clear away without harsh abrasives.